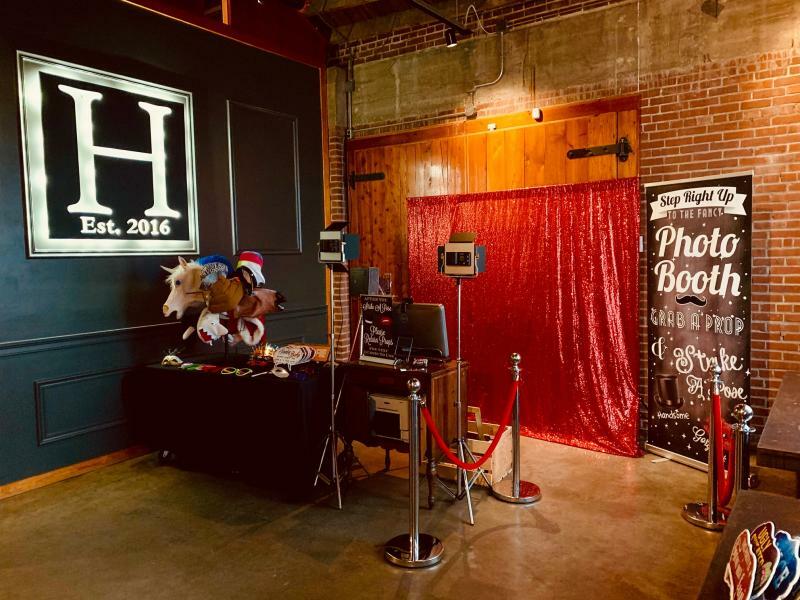 When you are celebrating a big event such as a wedding or graduation, you want to preserve the moment, so what better way than with your own personal photo booth? 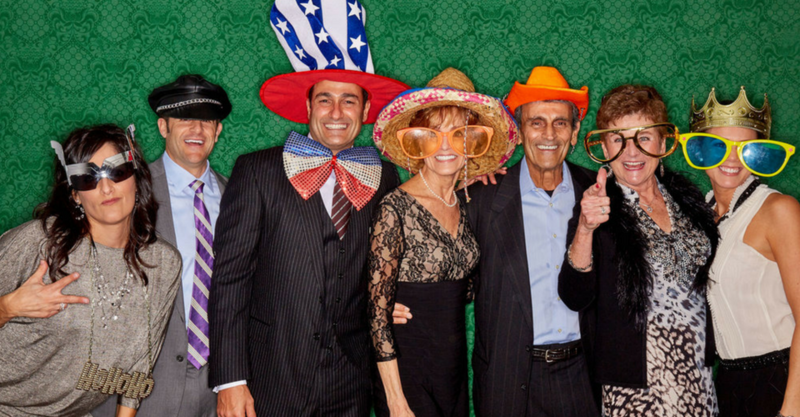 You can be sure that you and your guests will enjoy the limitless photos personalized with amazing props that are sure to keep the laughs coming. 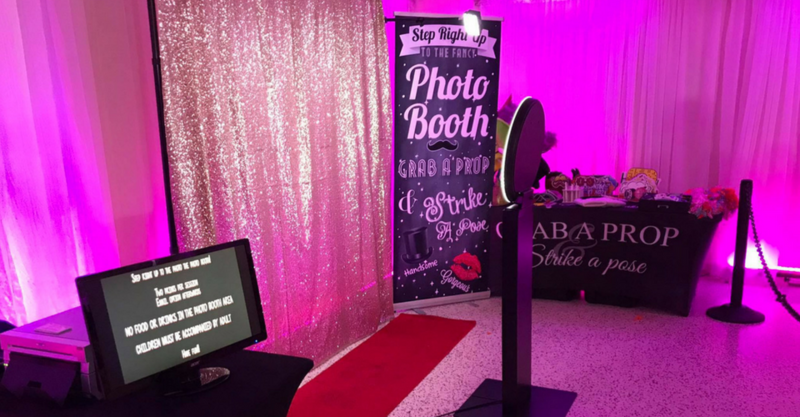 From birthday parties to family reunions, no matter what your occasion may be rest assured our photo booth services will be the highlight of your next event! Full color photo strip can be customized with logos, colors and more! You pick what goes on the strip! 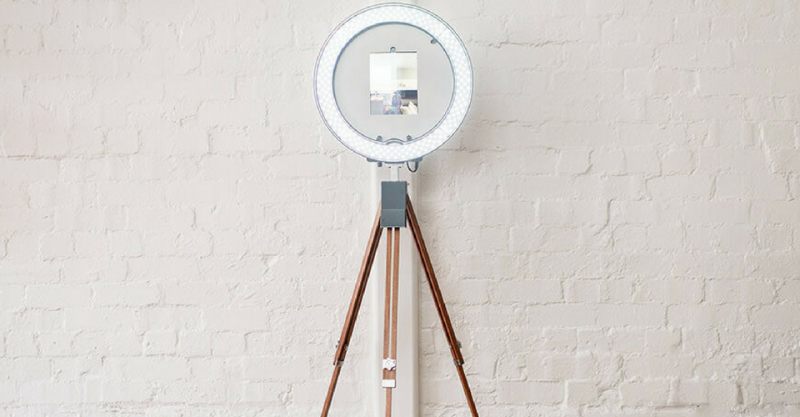 We offer an open backdrop photo booth style or a more conventional closed-in booth. The open style is perfect for larger parties since it allows more room for people and props! This really promotes interaction which livens up the party and creates wonderful pictures. 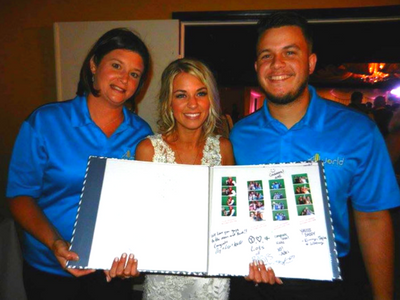 All photos come with full color strips with the event's name and date. Part of the fun with photo booths is the fantastic props! 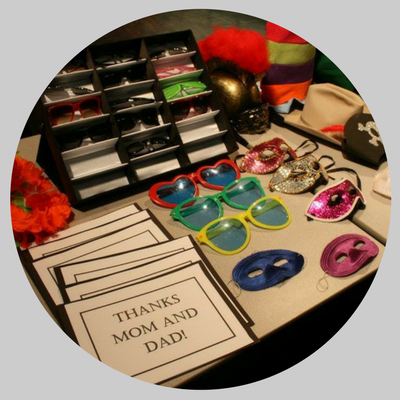 Some of which include a variety of funky hats, sunglasses, signs with funny sayings and of course, feather boas! And don't forget about our Social Media booth! 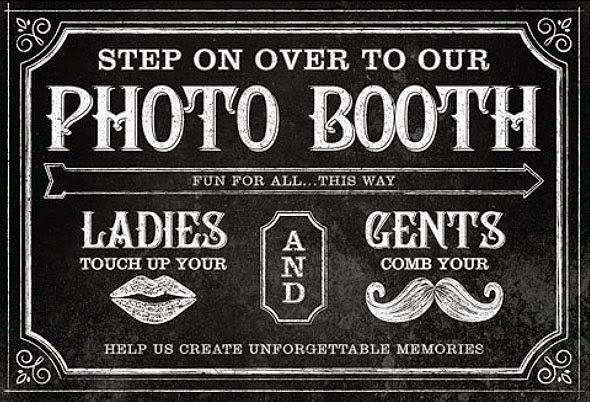 This is a smaller version of our traditional photo booth; all photos are sent via text message or email. Photo prints are not included, but are available as an add on if needed. Photos are also posted on our facebook page (@allworldphotobooth). Photos can be printed onsite or sent via text or email. All World Entertainment is 5 star for sure. The DJ was wonderful, with fantastic mixes and played a variety of music genres to meet the needs of the crowd. Karaoke was available as well. The owner Scott was very accommodating with meeting our needs and made all our announcements throughout the evening and helped keep the energy up. 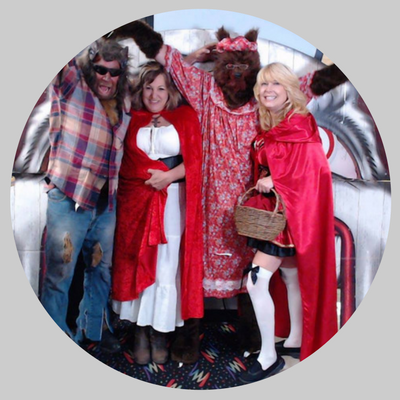 To top it all off there was also an amazing photo booth with props that was alot of fun for all. Loved the photo strip souvenirs from the night. 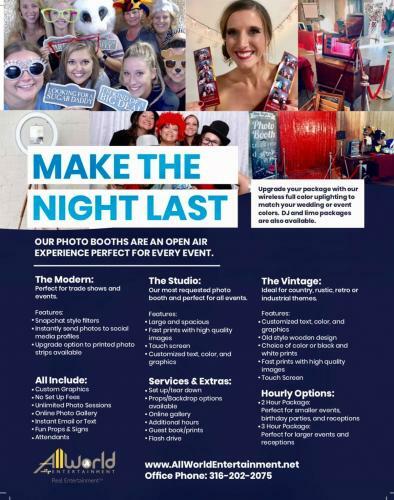 Without hesitation, I would recommend Scott and All World Entertainment for anyone needing a DJ and/or Photo booth. The Wesley Rehab Christmas party wouldn't have been the same without you. Thanks again. Using All World Entertainment was the best decision we made! They provided the music for our ceremony and kept our guests entertained during the whole reception. 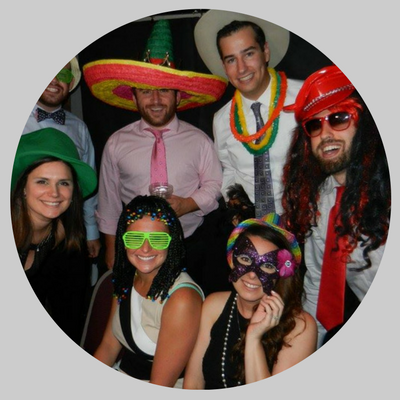 We paid for the photo booth and all our guests loved it, especially the kids! They even gave us a book with all the pictures taken in the photo booth. I was having trouble with song selection for the dance and Scott helped with everything. They kept the evening running smooth and I didn't have to worry about a thing. We then finished off our incredible day with one of All World Entertainment's Limos which was a perfect way to finish off our Wedding Day. Thank you Scott for helping to make our dreams come true and making sure our wedding day was something we will both remember for the rest of our lives. I would definitely recommend Scott and his All World Entertainment staff to all future brides!